Businesses often keep cash in banks, as well as have cash in hand on their premises. They do this for many reasons. One is that cash is not all kept in one place, thus reducing the risk of theft (it’s more difficult for a thief to steal money from 2 places instead of one!). Banks also record the cash transactions independently, which serves as a check against the recording done by the business itself. And in today’s age, bank accounts are convenient because funds can be electronically transferred – for instance, to pay into creditors’ bank accounts, to buy goods online and to pay credit cards. At the end of every month (usually), a summary of all bank account transactions is received – called a bank statement. 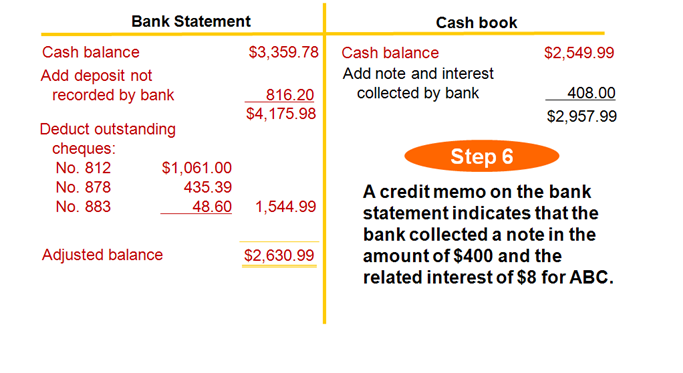 The bank statement shows the beginning balance (brought forward from the previous period/month), additions, deductions, and the ending balance. But at the same time, a business will also keep track of the transactions going through the bank account, in a cash book. Hence, there are 2 sets of records documenting the same thing – the bank account transactions. Inadvertently, there will be differences between the 2 records. 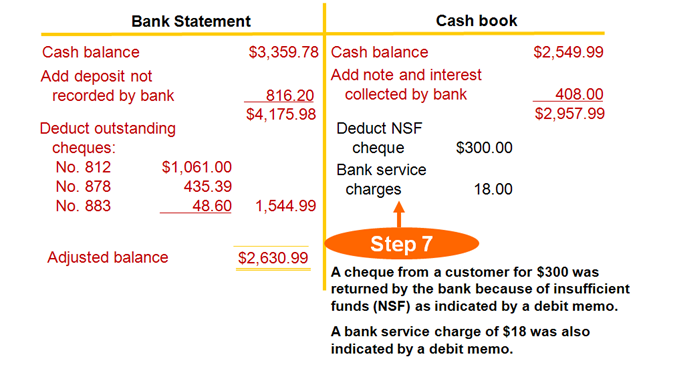 For example, bank charges could be deducted directly by the bank (and hence appear in the bank statement), and the business would not know about it (and hence they would not be recorded in the cash book) until the bank statement is received. Also, money could have been banked into the bank account (and recorded in the cash book) but the funds would not appear in the bank account (and bank statement) until a few days after, due to the bank clearing process. Or a cheque could have been issued to a creditor (and recorded in the cash book), but the creditor might not draw on it until much later, since a cheque remains valid for some time. So during that time, the funds still remain in the bank account, undrawn on, and the bank statement should reflect this. 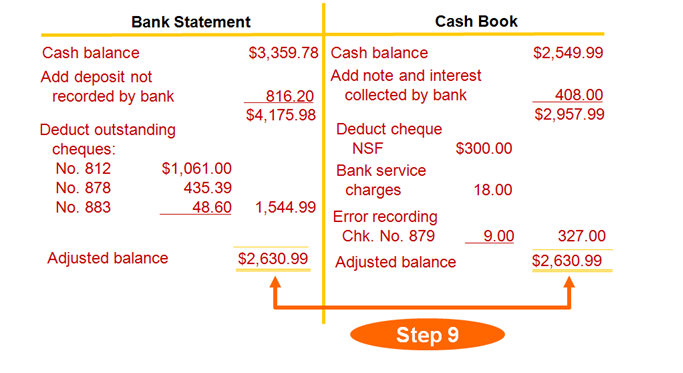 Therefore, a bank reconciliation statement is created to analyze the items and amounts that cause the cash balance reported in the bank statement to differ from the balance of the cash account in the ledger. Why do we do this? Well, for one, it is to check whether there are any transactions in the bank account that was missed out in the cash book – if so, then these need to be adjusted in the cash book accordingly. Another reason is to see if there is potential fraud, which will need to be investigated into. But more about that at the end of this section. We start with the bank statement. 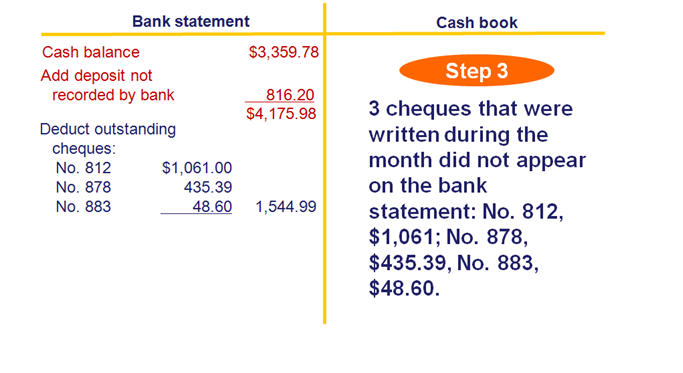 2.	items that show in the bank statement as a receipt/payment, but do not yet appear as such in the cash book. Firstly, we consider deposits that have been banked into the account, usually towards the year end or on the year-end date, but are not cleared in the bank account. The clearance usually takes a few days. 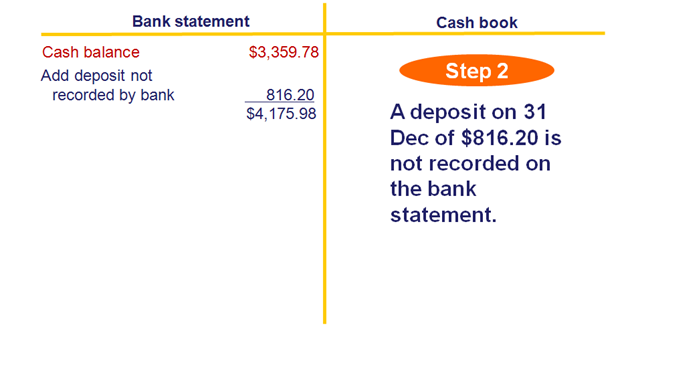 During that time, the deposit is recorded in the cash book, but not yet in the bank statement. Next, we consider cheques that have been issued but not drawn on/submitted for payment. They are considered as “paid” in the cash book, but the funds are still in the bank account. Therefore, they are deducted in the bank statement. At this stage, the bank statement has been fully adjusted. 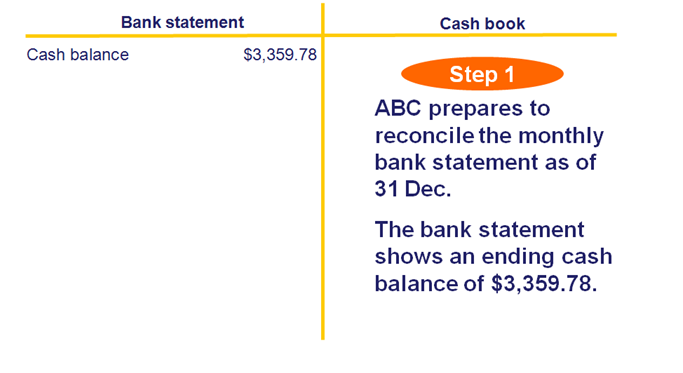 Now we look for items that will adjust the balance in the cash book. 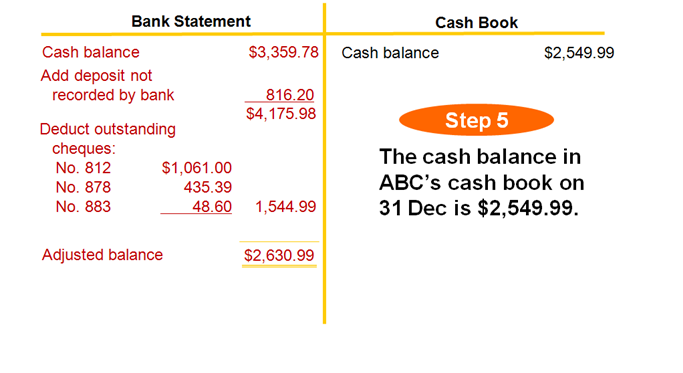 First, we determine the current cash book balance. Then, we consider money/funds that have been deposited/banked into the account directly, without our knowledge. These are added onto the cash book balance. Next, we need to consider any money/funds that have been deducted from the bank account directly, without our knowledge. These should be deducted from the cash book balance. 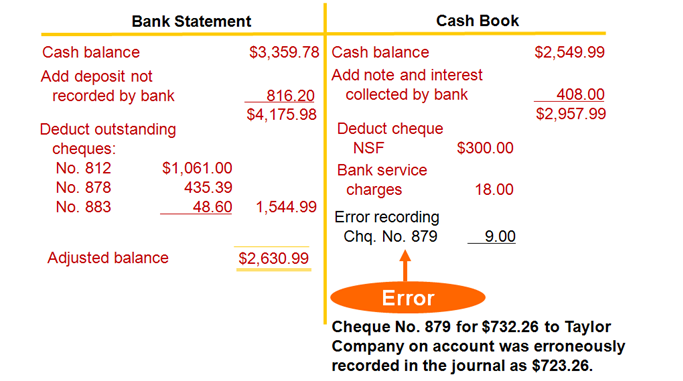 We also need to check if there are any recording errors made in the cash book. In this example, Cheque No. 879 was understated by $9 ($732.26 - $723.26). Hence, the difference needs to be added back to the cash book balance. 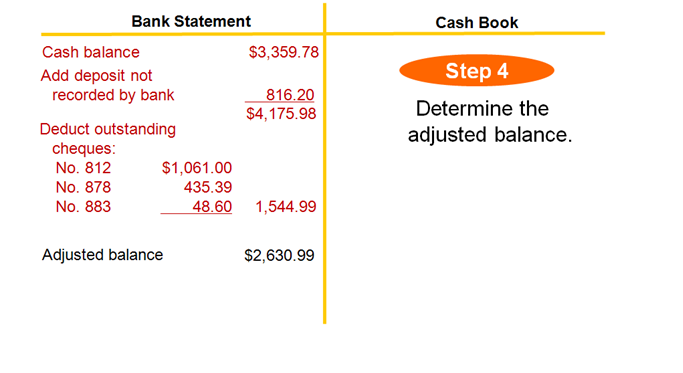 …and we see that both the adjusted bank statement and cash book balances agree. 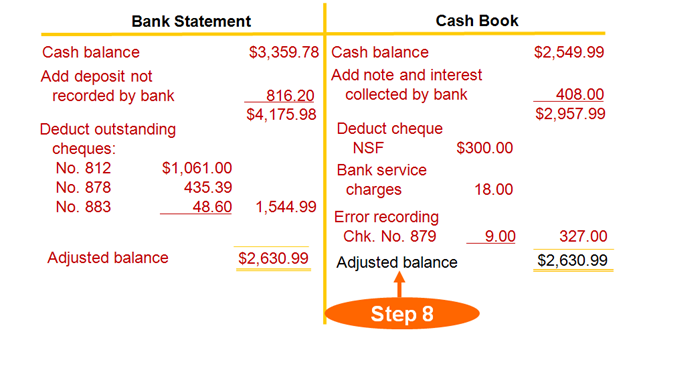 The bank statement will “adjust” itself in due course, because the reconciling items in the bank reconciliation statement are just timing differences, i.e. differences that arise due to time delays. But the cash book is under our control, and we need to update it accordingly. We have said earlier that the bank reconciliation statement is a tool to catch/find potential fraud. For example, when fraudulent entries are made in the cash book, these entries will not eventually show, or clear, in the bank statement. When the bank reconciliation statement is prepared, they will show up as reconciling items, a red flag, which can then be investigated. Return to Accounting Adventurista Home from Bank Reconciliation Statement.